Oh ho! That poor worm. I think I'd worry too. Fun illustration. Love the collage Jo. Hope everything is going well. Too cute! Poor little worm! it certainly does fit...what a heapful of worry for Mr. Worm....yikes !! 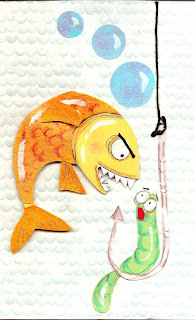 The worm looks worried but the fish is the one who should really be worried. Very expressive and great colors. I love the textures on this! Really a great piece! Hey Jo, Just wanted to check in on ya and let ya know I miss your work. Give me a buzz soon.